International credit rating agency Standard & Poor’s (S&P) has downgraded TT’s outlook from stable to negative, but it has held the country’s credit rating steady for the first time in three years, which, as far as Finance Minister Colm Imbert believes is the most important thing. “The most import aspect of a credit rating is the rating itself. So, they have affirmed our rating as investment grade. For the last three years, since 2014, we have been downgraded because of the collapse of oil and gas prices and production. What have tried to do at the Ministry of Finance is make sure we have not been downgraded again and S&P has maintained and affirmed our rating,” Imbert told Sunday Newsday. In its report released Friday, the New York-based S&P said it revised its outlook on TT from stable to negative, but affirmed the BBB+/A-2 long- and short-term foreign and local currency sovereign credit ratings, as well as the “A” transfer and convertibility assessment on the country. Transfer and convertibility refers to the capital and exchange controls instituted by Government that may affect an individual or entity’s ability to convert local currency into foreign currency or transfer funds to non-resident creditors. “The negative outlook reflects our view that there is at least a one-in-three chance that we could lower the ratings over the next 12 to 24 months,” the S&P report said. Moderately higher energy output and prices may lead to mild economic recovery and a smaller current account deficit, S&P added, but there remains uncertainty about whether this recovery will be sufficient to mitigate the impact of imbalances in the economy. Among those imbalances are familiar concerns— exchange rate pressure, restrictions on accessing foreign currency, negative yield differentials on short-term treasury securities relative to those of the US, and historical gas supply shortages. These, S&P said, could lead to a faster depletion of the country’s external assets, or a weakening of the effectiveness of monetary policy. “Under this scenario, we could lower the rating,” the agency said. It could also lower the rating in the next two years should Government’s fiscal consolidation measures fail to shrink the deficit to the degree that it forecasts, leading to larger increases in net general government debt, or higher interest payments; or if Government fails to implement key institutional reforms such that large revenue collection leakages and weaknesses in data provision persist into the foreseeable future. 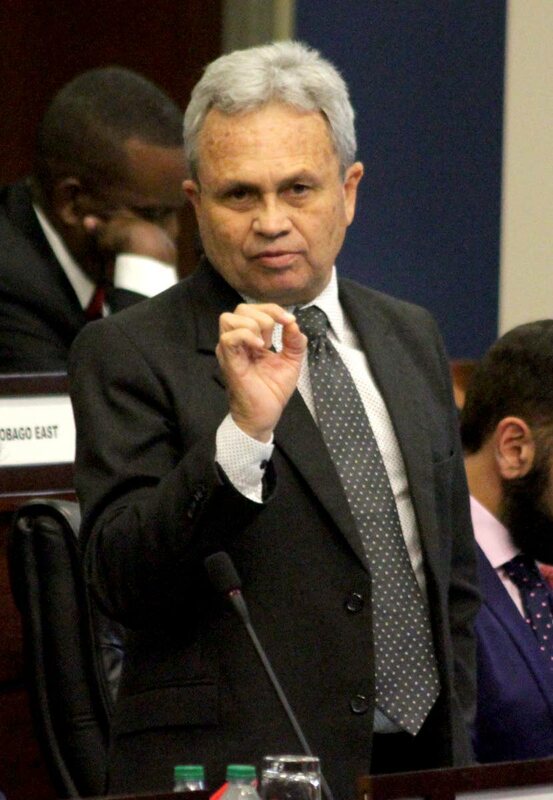 Imbert was not too worried about the agency’s outlook. “They are not satisfied that some of the projections from the energy sector are accurate. They’re saying they will be changing to stable if the outlook for oil and gas production are achieved,” he said, acknowledging that the country took a hit over the last few years with the collapse of commodity prices coupled with a drop in production. At the lowest point, he said, gas production had fallen to three billion cubic feet a day and manifesting itself most notably in the curtailments in the downstream sector. “But we have managed to recover most of the shortfall. In January this year, gas production was up to 3.9 billion cubic feet and we expect it will average 3.8 billion cubic feet this year, next year, four billion cubic feet, then 4.1 cubic feet in 2020—based on discussion with Shell and BP,” he said, referring to two of the country’s biggest natural gas producers. Prime Minister Dr Keith Rowley held talks with Shell and BP while in London for the Commonwealth Heads of Government Meeting last week, and on his return announced discussions to review agreements with the energy giants. “Their approach right now is wait and see. They will put us on ‘stable’ so long as targets are met,” he said. Regarding S&P’s concerns about foreign reserves, Imbert said the energy sector is the main supply of foreign exchange in the country, so if production does not increase to the point of reserves, there will be a continuous decline. Foreign reserves at the Central Bank are just over US$8 billion, compared to over US$10 billion just three years ago. “The most important thing, though, is that for the first time in three years we have not been downgraded,” he reiterated. Former energy minister Kevin Ramnarine weighed in on the report, saying that the negative outlook came as no surprise since the report seems to make it clear that the change in outlook was driven by macroeconomic imbalances. In his round-up of the report, which he sent via email, Ramnarine noted investor uncertainty, especially in the energy sector, as something that needs close attention, particularly after the “public flogging” of the industry at the Spotlight on Energy event in March. Natural gas shortages cannot be sustained, he said, despite the initial rebound. The Central Bank also has a moral obligation now to address the foreign exchange rate, he added. S&P’s rating comes just after the International Monetary Fund in its World Economic Outlook earlier this month projected growth in the economy at 0.2 per cent for 2018, compared to the ministry’s one to two per cent target. S&P’s target is 1.6 per cent, compared to a contraction of 0.8 per cent last year. Reply to "COLM: NO WORRIES"